Open concept modern 1 bedroom cottage directly on the Black River. Beautiful view of the water with no one across from you. Includes linens, towels, bonfire wood and bbq propane. - Cottage contains complete equipped kitchen with sit up bar area plus starter coffee and tea with some condiments and spices. dining room area seats 4+ . Living room has couch with pull out bed, 42" HDTV,, sat cable TV, Blu-ray player and stereo. Bathroom includes shower with Jacuzzi tub. Bedroom has queen sized bed with linens included. Plz Let us know if you have your own linens. Laundry room- washer and dryer available to use. - Walk out to Large deck and BBQ area. Yard has large picnic table, hammock, fire pit area. 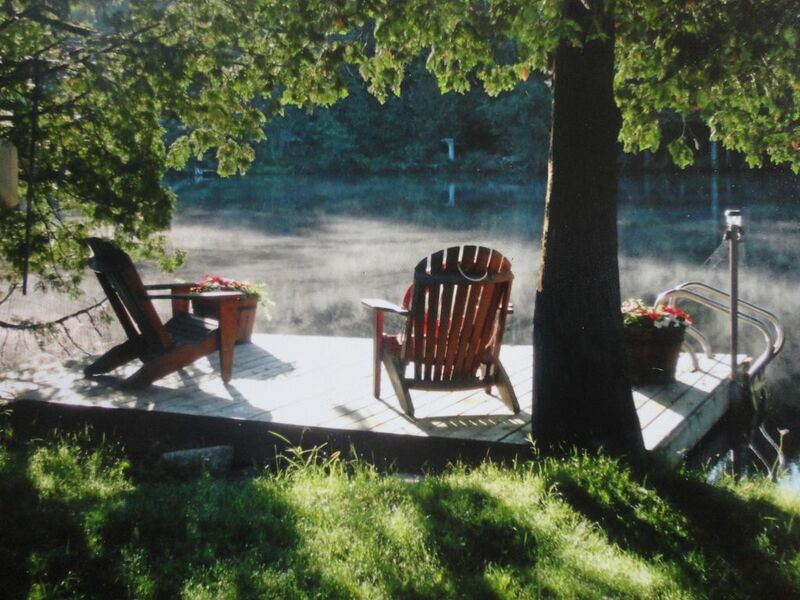 Dock is a great area to relax on the Muskoka chairs or go in for a swim. Small shed contains life jackets, river raft and float tubes and fishing rods and tackle. Is great for change room. - Kayak and canoe rental available at reasonable rates that incudes pick up and delivery service. If you have your own boat, launch is just down the road. - 2 minute drive into town of Washago has full grocery store, restaurants, small shops and lcbo just around the corner. Short drive to Casino Rama, Golf courses, bike and walking trails, Orillia, Gravenhurst and Bracebridge. Property may not be the most suitable for small children and NO pets allowed. ... and much shorter this time, but still a great place to relax. Clean, quiet and with every convenience included. Couldn't ask for more. Beautiful property. Fire pit was perfect. Was nice to be able to be so close to the water. Loved the place. Nice and quiet. Loved being right on the water. Cottage was very very clean. Very beautiful. Surrounding area is bery peaceful and quiet. I would definitely recommend this location for a getaway. The hosts were very nice. The location is scenic, peaceful and very tranquil.A very comfortable stay. Peaceful. Beautiful surroundings. Modern facilities. Everything you could ask for in a vacation retreat. This was my second stay at Riverside and hopefully there will be more to come. Stunning property right on the water, very private and quiet. Has everything you need! Would recommend this place to anyone who is looking for a relaxing and romantic escape enjoying nature. We rented kayaks from a local business and really enjoyed kayaking along the river. We spent most of our time swimming right off the dock and laying in their provided floaty lounger for 2. Was very peaceful with wonderful spots around the property for reading or napping (hammock was our favourite!). There are lots of bugs out at night, which is to be expected. Would recommend wearing long clothes and bug spray to avoid the bites around the camp fire! We hope to stay again soon!